Miss Yvonne was sharing her spinning skills and happily reported that she had completed a trio of Angora yarns. Woo Hoo! Spun from just 1.5oz of our delicious 'Spun Sugar' hand dyed & carded English Angora fiber, she had chosen the 'Heathered Harmony' colorway at the Shepherd's Extravaganza. She was kind enough to send us a photo! 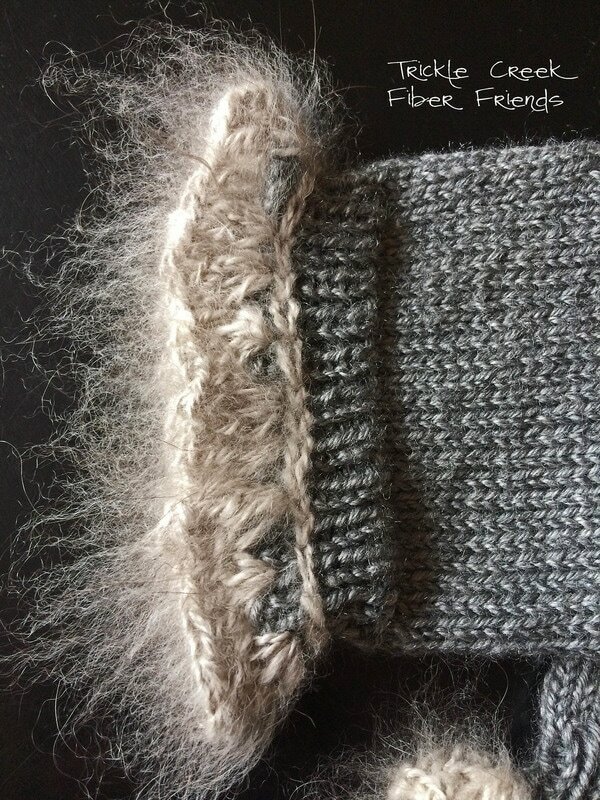 Later, she reversed and modified an existing pattern to be certain she had enough cuff without running out of yarn and shared a pic with us. She'll be wearing these as she demonstrates her skills in the chilly 'J' barn! She's also looking to acquire more of our fiber as her daughter wants a pair of her own as well! At the wonderful Plateau Farmers' Fiber Festival, Jr. Farmer found Miss Evelyn (our first spinning instructor from years ago) sporting one of his hand turned shawl pins! Asking her approval, we snapped a picture of it happily keeping this beautiful piece snuggly around her shoulders. Surprisingly, she did not make this particular piece (although she is a talented fiber artist) but won it at a local fiber event. She was especially pleased with how they went well together. She and her hubby, Dan, are all too familiar with the work involved in the Shepherd's Extravaganza at the Washington State Fairgrounds so it was a relaxing treat for her to enjoy an event so close to home! Sometimes there is a specific tweak that someone would like for their heirloom quality turnings. In this case Jen was making a beautiful shawl and wanted just the right sized shawl pin that didn't exist in Jr. Farmer's inventory. He offered to make her exactly what she was looking for, if she could wait until after the Shepherd's Extravaganza. He provided her with a sketch which she approved and got to turning when his schedule allowed. Sometimes that can be challenging with his High school schedule! As it turns out (pun intended) he was able to deliver it to her... just as she finished it! You can read more about it here, if you like! Spun on a FMTY Supported Spindle! Jr. Farmer's wood turnings (From Me To You) have been welcomed at his first event with open arms and the first product of one of his Supported Spindles was beautiful! He received a LOT of excellent feedback and encouragement for his quality workmanship while his pieces quickly disappeared! Made out of oak and yes, that's an acorn tip, the dish (not shown) was also hand turned with oak. What you cannot see is the Wraps Per Inch recession on the shaft - so handy! 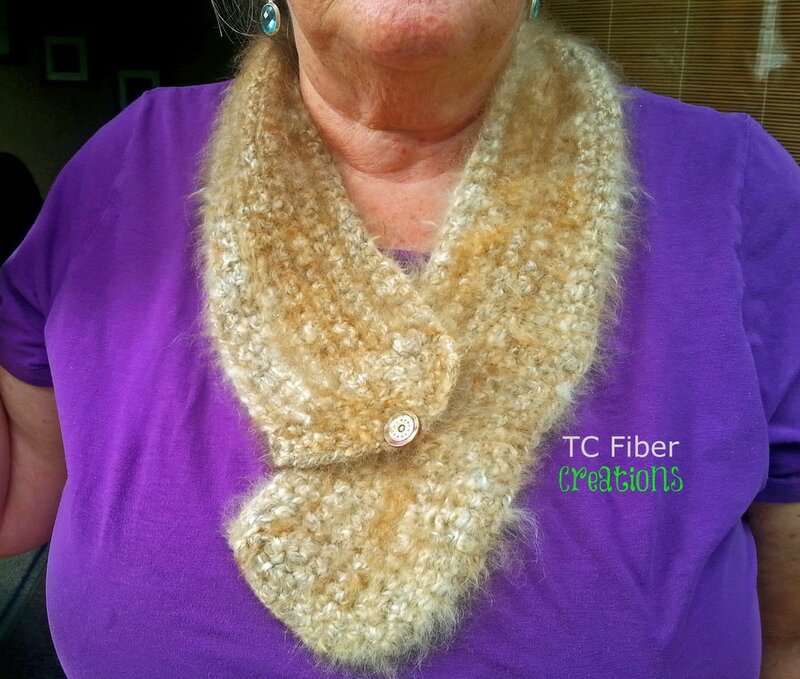 Made with TC Angora Yarn! These beautiful hand knit wrist warmers were created by our dear friend Sharon. She loved the feel of the Angora and is an excellent knitter! Her challenge was finding the perfect project to highlight it's thermal value and enable her to enjoy it next to skin. She had no problem integrating it into her design but wanted to make it last longer so she used it as a crocheted accent hoping to enhance more projects in the future. It was a treat for Sharon to share her creation with us and we're glad for another happy Trickle Creek Hand Spun Yarn Customer! This beautiful, warm scarf was hand crocheted by our friend Mary. She's the most sought after Massage Therapist in our area with over 30 years experience. She's also an accomplished crochet artist, offering her wares at a popular art event every year. She was thrilled to have her hands on this amazing red 100% Satin Angora yarn Mom spun up. She pondered the best use of this luxury yarn and settled on a small scarf. She is still impressed by how warm and soft it is! We think she picked the perfect button for accent and it's just the right size to keep her neck snuggly warm! Miss Heather has been busy in her dye studio and has graciously shared her experience with us! 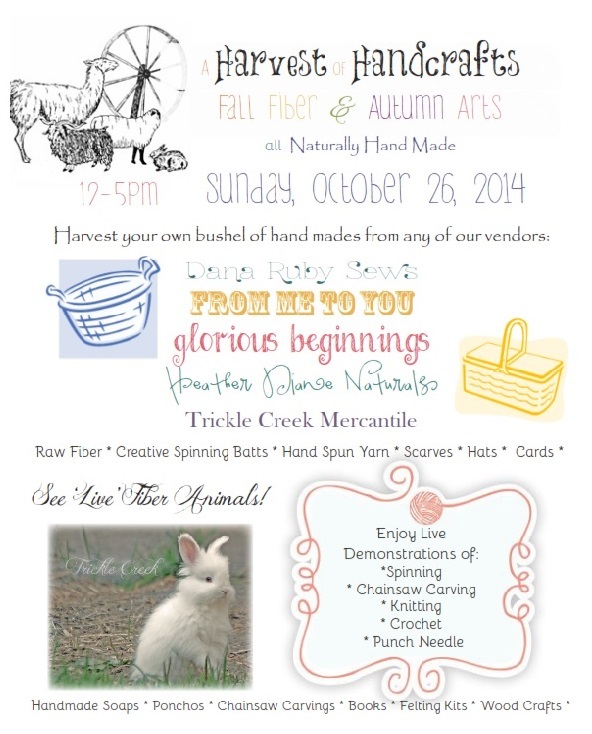 Schafer Meadows Fiber Arts Festival! The children will be helping with educational demonstrations and each of them are preparing special items to offer that have not been revealed before! If you'd like, bring your spinning wheel and join us, take some free classes, or come to enjoy a HUGE number of creative fiber enthusiasts and their wonderful wares!